Based on the time, day, month and year of your birth, you can determine your self-element and whether you are a strong or weak element. This translates to how the five elements (wood, fire, earth, metal and water) influence our lives based on the destructive and constructive cycles of elements. Depending on whether you are a strong or weak element, you can introduce colours and material types into your living environment to help enhance your life further. For example, if you are a weak metal person, the element needed to fuel your personal strength and resource luck is earth. Other suitable elements would be metal to enhance your self-element, as well as wood to attract wealth luck. Beige coloured marble flooring can be used to augment the element of earth energy, with white washed walls can symbolize metal energy. 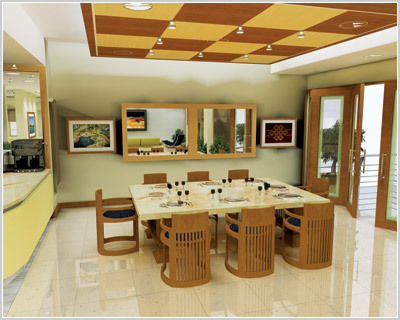 Wood can be introduced through the furniture and any ceiling design features. Living plants can be introduced into your living space to create yang wood energy. 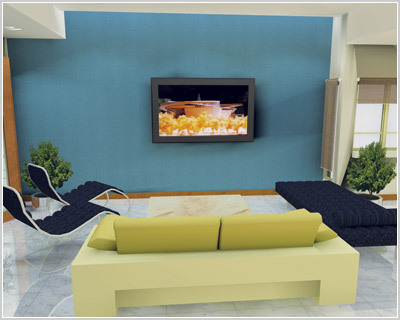 Such living room design arrangements are suitable only for persons lacking in earth energy. The choice of materials can be most useful for introducing the type of elements you need into your living space. In the scenario shown here, the use of metal is fully utilized through the furniture, and earth energy is achieved with the use white marble, which creates a white ambiance to the dining area. White walls are used to enforce the need for metal energy, while natural wood trimmings are included to balance out any ‘hardness’ in the dining area. Natural wood finishes tend to create a warm feel to the space and is a great balancer for ‘hard’ finished environments. The final product is a space that strongly enforces the use of metal elements, yet controlled subtly with wood energy, perfect for weak fire persons. Wood energy symbolizes the support and resources for all fire persons while metal is the element for wealth energy. For weak fire persons, earth energy is not sought after, but earth represents intelligence and creativity, so small amounts of this element can be introduced through the use of marble or granite tabletops. For persons whose self-element is weak wood, there is a lack of water energy which can be introduced through the colour of the walls. The strong contrast of colours undoubtedly creates a feature wall in itself, synergized with the use of black leather furniture, as both colours are symbolic of water energy. To add balance to the room atmosphere, white colour marble tiles are introduced as both metal and earth energy, as earth energy here activates the wood person’s source of wealth, while metal energy helps produce water energy, which then strengthens a wood person’s self element. Yang wood energy can then be introduced through the use of live plants as well as slight trimming of floor skirting and door frames. For strong persons, the elements needed must follow the destructive cycle so as to calm your self-element down. Being too strong an element will cause your self to be UNABLE to enjoy the luck in your life, as there is too much strength. The concept in introducing elements into your living space is always to maintain balance in your chart. In this scenario of a strong earth person, there is a need for metal and water energy to exhaust and distract the earth element. 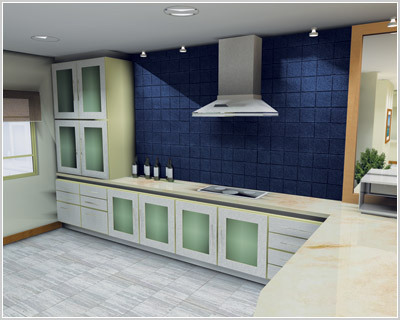 In the rendering of a kitchen above, blue-coloured tiles are used to symbolize water, while the cabinet doors are lined with brushed steel finished to represent the metal element. The colour of the cabinets should follow a light colour theme such as white or even light blue hues to compliment this concept. To fully integrate the metallic white tone concept, white marble or light tone ceramic tiles can be introduced to fully carry through this kitchen design. Such bold colours tend to explore a modernist feel, creating a strong yang environment. A yang environment is determined by your living space as being too strong or bold without any soft furnishings. The use of bold colours such as strong blue, whites or blacks can create a living space as being too masculine or yang. To balance out, soft furnishings such as curtains, pastel colours, greens and yellows can lead to a well-balanced living environment. 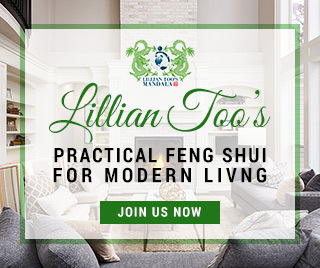 In any living space, the use of all five elements can help balance the yin and yang energies of the room. 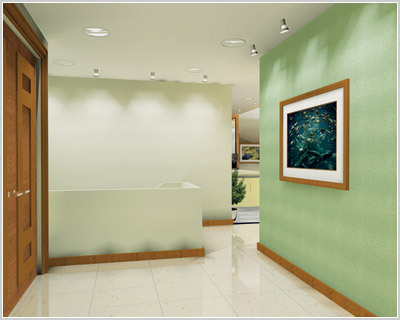 In the image on the left, this entry foyer encompasses all five elements through the earth-based marble flooring to green feature walls and natural finished doors (or wood energy), white wash walls to balance the rest of the space (metal), blue paintings (water) and capped with plenty of down lights and halogen spotlights (fire energy) to enhance the brightness and ambiance of the space. So depending on the type of self element you are, you can look into the many possibilities of enhancing your living environment through the use of colours, type of building materials and furniture you choose, and more importantly, to create a living space that is suitable to your elemental needs without sacrificing on aesthetic value.